Clarence Herman Wilhelm Zebell, 96, of Glencoe, passed away Monday, Jan. 28, at Glencoe Regional Health Services in Glencoe. Funeral services were held Saturday, Feb. 2, 11 a.m., at St. John’s Lutheran Church in Plato, with interment in the church cemetery. “What A Friend We Have In Jesus,” “Precious Lord Take My Hand,” “Rock Of Ages,” “In The Garden,” and “How Great Thou Art” were the congregational hymns. Bruce Kohls, Dwaine Zebell, Gary Zebell, Randy Breyer, Tim Breyer, and Scott Lange were the casket-bearers. Clarence Herman Wilhelm Zebell was born June 28, 1922, in Bergen Township. He was the son of Emil and Laura (Tonn) Zebell. Mr. Zebell was baptized as an infant July 23, 1922, by Rev. Baumhoefener and later was confirmed in his faith as a youth April 5, 1936, by Rev. Schert both at St. Peter’s Lutheran Church in Bergen Township, Lester Prairie. His confirmation verse was 2 Corinthians 12:9. Mr. Zebell received his education at a country school thru the eighth grade. Mr. Zebell was united in marriage to Violet Oltmann at St. John’s Evangelical Lutheran Church in Helen Township, Glencoe June 30, 1950. He and Violet made their home in Plato and Glencoe. This union was blessed with three children, Craig, Laurie and Patti. They shared over 68 years of marriage. Mr. Zebell worked at the Plato Feed Mill in Plato and was the maintenance man for the City of Plato. After he retired, Mr. Zebell mowed lawns for others. 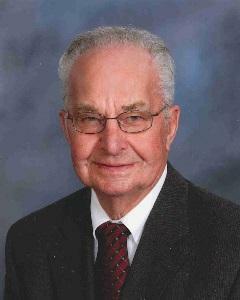 He was a faithful member of St. John’s Lutheran Church in Plato where he served as a trustee and usher. Mr. Zebell enjoyed woodworking and tinkering with items. He loved to watch the Wheel of Fortune and listening to polka music. Mr. Zebell treasured the time spent with family and friends. Mr. Zebell passed away Monday, Jan. 28, at Glencoe Regional Health Care Center in Glencoe, Minnesota, at the age of 96 years and 7 months. Blessed be his memory. Clarence is survived by his wife, Violet Zebell of Glencoe; children, Craig Zebell of Colorado, Laurie Arredondo of Glencoe, Patti Klopp and her husband, Otto, of Glencoe; grandchildren, Daniel Zebell and his fiancé, Zehn, Michael Zebell and his wife, Katie; great-grandson, due in March; step-grandchildren; step great-grandchildren; brothers, Maynard Zebell of Glencoe, Vernon Zebell and his wife, Marlene, of Waconia; sisters-in-law, Bernice Breyer of Glencoe, Ona Lange and her husband, Bob, of Brainerd, Lois Oltmann of Howard Lake; brothers-in-law, Ed Marklowitz and his friend, Marlys, of Litchfield, Elmer Oltmann Jr. and his wife, Bev, of Ohio; nieces, nephews, other relatives and many friends. Mr. Zebell was preceded in death by his parents, Emil and Laura Zebell; sisters, Luella Graupmann and her husband, Hillard, Viola Kohls and her husband, Walden, Elaine Latzig and her husband, Melvin; brothers, Leonard Zebell and his first wife, Leona, and his second wife, Barb; sisters-in-law; brothers-in-law. The Johnson-McBride Funeral Chapel in Glencoe assisted the family with arrangements. Its Web site is www.mcbridechapel.com where online obituaries and a guestbook are available.